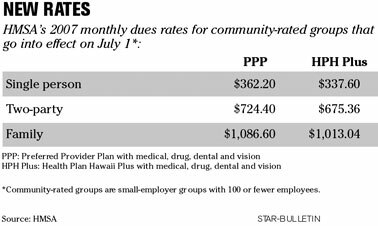 Hawaii Medical Service Association, whose rate increases came under scrutiny in the just-concluded legislative session, said yesterday it will raise premiums again. As of July 1, rates for its small-business groups will go up by an average of 6.6 percent for its preferred-provider plan and an average of 5.1 percent for its health maintenance organization plan. HMSA's rate increases, which apply to medical, dental and vision care as well as prescription drugs, will affect 11,000 small businesses and 143,000 members. The state's largest health insurer timed its announcement to coincide with the release of earnings figures that showed it lost $687,382 in the first quarter, compared with a net gain of $8.4 million in the year-earlier period. Chief Financial Officer Steve Van Ribbink attributed the loss to a 5.7 percent increase in health care costs that outpaced a 2.1 percent gain in total revenue. The latest rate increase, which had to be approved by the state Insurance Division during the previous three years, does not need state approval this time because the law requiring it expired June 30. Lawmakers passed a new bill this year that restored the rate-approval requirement, but it does not take effect until Jan. 1. Hawaii Medical Service Association, citing rising health care costs and a money-losing first quarter, is raising premiums again. The state's largest insurer, which has 708,451 members, said another rate increase is necessary after suffering a net loss of $687,382 in the first quarter amid escalating benefit and service payouts. It had a net gain of $8.4 million in same quarter last year. Beginning July 1, HMSA will increase premiums for small-business employers by an average of 6.6 percent for its preferred provider plan -- the predominant choice among its members. 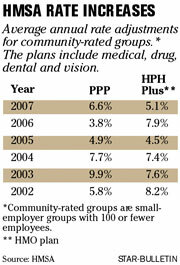 Rates will go up an average of 5.1 percent for its HPH Plus plan, its health maintenance organization. Overall, the increases will affect some 11,000 businesses of 100 or fewer employees, with about 143,000 members. The new rates will apply to medical, dental and vision care as well as prescription drugs. "Our whole mission is to provide quality, affordable health costs to our members," HMSA Chief Financial Officer Steve Van Ribbink said yesterday. "We always try to side on conservatism and try to keep rate increases down and to keep them stable so we don't see huge volatility in rates. But we also need to keep our rate increases fairly close to what we see in health-care cost trends because when we go in there with this rate July 1, we're stuck with it for the following 12 months." HMSA, which had to get state approval for its rate increases in the previous three years, does not have to go through that process this year since a 3-year-old state oversight law lapsed on June 30. But lawmakers passed a new bill in the last legislative session that will require HMSA to go through the state Insurance Division for any rate increases that take effect as of Jan. 1. HMSA will need to get state approval when many of its large-employer groups renew their insurance premiums in January. Last year, HMSA increased its preferred-provider rates 3.8 percent -- its smallest increase since 1997, when the average rate increase was 2.8 percent. But health care benefits that HMSA paid out this year rose 5.7 percent to $418.7 million while its revenue increased just 2.1 percent to $453 million. "Revenues went up; health-care costs went up a lot more," Van Ribbink said. "The difference between the revenue and our direct benefit costs was about $13 million less than the year-earlier quarter." Van Ribbink said the increase was smaller than other rate hikes being implemented this year by many other insurers. He said the California Public Employees' Retirement System (CalPERS) will increase premiums an average of 11.9 percent in 2007, while separate surveys conducted by the Segal and Milliman consulting firms showed that companies they advise will see rate increases of 11.1 percent and 9.7 percent, respectively. He said the amount of this year's increase was not affected in any way by lawmakers' decision to restore rate regulation. "Nope. It didn't this year. It didn't last year," Van Ribbink said. "We just rate the way we rate, and we always have." State Insurance Commissioner J.P. Schmidt said he could not comment on the appropriateness of the new rate increase because he had no authority to review the data needed to evaluate it. "Their decision to increase rates at this time appears to be addressing the rising cost of health care," Schmidt said. "The rate increase was not done in the midst of the fight over rate regulation, and it's not done with my oversight, so I assume it's meant to address the current trend of costs and expenses they'll have and, perhaps, maybe anticipating the rate regulation that is to come." HMSA had argued against restoring rate regulation because it felt it was unnecessary, but Van Ribbink said he could live with the law since it did not cap reserve levels at 30 percent as had been proposed in an initial version of the bill. HMSA, which depends on its reserves for investments and for potential catastrophes, had a reserve level of 30.8 percent of annualized costs at the end of the first quarter. Schmidt said he was glad to see the Insurance Division reassume state oversight. "The cost of (heath insurance) has a big impact on their budget. It's also something that's required to be purchased by the (state) government in most instances, and to have some government oversight provides some confidence to people that it's appropriately priced," Schmidt said. "In any line of insurance, when you don't have enough competitors to really have fair competition, then you can't really rely on the market to set the price," he added. "You need to have some kind of oversight to make sure the playing field is level with all."